This is the main area for everything HeroScape. This is where you can rate and review the game as a whole, as well as add general tips and discussions about the game. The Marro have been called to Valhalla to carry out Utgar’s demands at all costs. However, hidden deep within the uncharted jungle, a lethal Marro hive is breeding venomous predators! Will the world’s Heroes be able to battle through the dark and murky jungle to defeat these savage creatures? Or will the Marro follow through with their mission to contaminate the world? The answers lie within the game of Heroscape. A game of Heroscape really begins with building the battlefield. 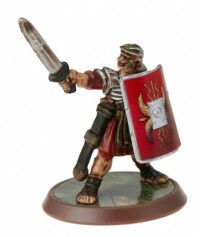 Your Heroscape Master Set offers several to choose from, and they can also be found right here on this website. Link and stack grass, sand, rock and water tiles to form cliffs, mountains, rivers, overhangs and more. The level-by-level pictorial guide makes building your Heroscape battlefield easy and fun! Each Heroscape battlefield includes at least two exciting game scenarios. The scenario you choose will show you how to set up your game and explain the victory conditions for each player or team. Play them all, and then try creating your very own Heroscape battlefields and game scenarios! Once your Heroscape battlefield is ready, it's time to gather your army. In the Basic Game of Heroscape, the armies are pre-set for both players. Just decide which army you'll lead, then take those army cards and place those figures according to the setup guide in your Basic Game scenario. The Heroscape Master Game offers more choices for gathering your army. Choose your favorite Heroscape Hero or Squad figures, not exceeding the point total for that scenario. When playing a Heroscape Master Game scenario, you can either bring along a pre-made army, or you can take turns "drafting" army figures until all players reach the point total for that scenario. 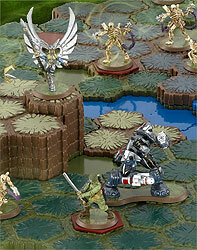 Have you chosen your armies and placed them on the Heroscape battlefield? Now you're ready to rumble! The game of Heroscape is played in rounds. Each round is made up of three turns for each player. On a turn, each player will generally do these three things: 1) Choose an army 2) Move one or more of the figures on that army card 3) Attack with one or more of those figures. Heroscape Figures move, attack and defend according to the Move, Range, Attack and Defense numbers on their army cards. Battles are resolved by rolling the combat dice. The attacker rolls the number of attack dice listed on the army card, hoping to roll as many skulls as possible. The defender rolls the number of defense dice listed on the army card, hoping to roll enough shields to fend off the attack. If the attack is successful, the defender is destroyed and removed from the game. The Basic Game rules of Heroscape are designed to introduce the novice player to the turn sequence and basic rules of moving and battling. The Master Game of Heroscape features advanced movement and combat rules along with special powers that will challenge your strategic skills to the max! 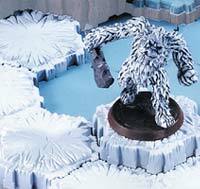 Whether you're playing the Basic Game or the Master Game of Heroscape, each scenario has a victory condition. The first player or team to meet this condition wins the game! The victory condition may be as simple as destroying all of your enemies. While it's always satisfying to be the last one standing on the battlefield, you'll often need to do something more (or at least different) to win. Some scenarios in Heroscape require that one army be the first to reach a certain spot, find a certain artifact, rescue a certain figure, or survive until a certain round. A war fought with characters from different genres and eras, played on a customizable 3D board. Choose your army, choose the order to play your heroes/squads, throw lots of dice several times each turn, move miniatures and attack. Although there are games with similar mechanics, there is no other game that plays like it or even replace it. – Build your terrain. You can choose one of the scenarios or build your own. – Choose your army. Each scenario has a total of points for the army. You must look at the characters, analyse their strengths and how they work as a group. Each hero (one miniature) or squad (more than one miniature) have a point value, movement, range, attack, defense and special powers. – Decide the order of play. Each player has four markers (1, 2, 3, X) that must be put on the cards that represent the characters to show the order of play. – Decide where to move your hero/squad and if you use any special ability. – If possible, decide wich miniature to attack. If so, decide if you will use a special attack. Pre-painted plastic miniatures, amazing terrain, immersive game play, variety of scenarios and characters, replayability. The game achieve its maximum potential with multiple squads of the same type. It is flexible in the sense that you can play short battles with 4, 5 figures or play Mega Heroscape, an epic war between dozens of units. If you do not like building things (Lego-like), setup time can be really long, anything from 15 minutes to 1 hour, depending on the scenario. The lucky factor is high, but flawless and flexible play usually leads to victory. Heroscape is more than a game. It is also a toy, a really beautiful one. The fun begins before the game starts, when the players build the terrain. Choosing an army is food for your thoughts: if you are careful your victory begins at this moment. The gameplay has an epic feeling, you are the strategist that must combine the best of your troops to achieve victory. 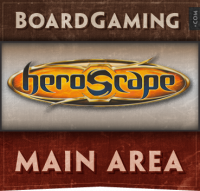 Add a Review for "Heroscape"